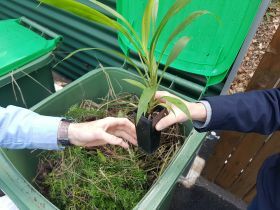 Redlands Coast homeowners are up for free native trees in August as IndigiScapes urges residents to become biosecurity-aware and rid their properties of invasive pests. Redland City Mayor, Karen Williams said whether you’re on the islands or the mainland, you can exchange a bag or bucket of weeds for a free local native plant. “Council is passionate about all things native and our IndigiScapes staff will happily identify your weeds for you on the day, or at the IndigiScapes Centre at Capalaba,” she said. “Take the opportunity to plant a eucalypt for a koala, or a she-oak for the endangered Glossy Black Cockatoo. “Replacing weeds with native plants is an excellent way to protect Redlands environmental diversity, agriculture and our community from the impact of pests and weeds.“Our naturally wonderful Redlands Coast has a varied wildlife habitat ranging from rainforest to coastal wetland with a wide diversity of plants and animals. Biosecurity is about the protection of our economy and environment from invasive pests and disease, and both Council and the Redlands community need to be vigilant. Residents can enhance biodiversity in their garden by managing weeds and pests, which in turn attracts native animals and insects and expands wildlife corridor connections to our nature reserves, giving safe passage to our travelling wildlife. “Quite apart from that, gardening is therapeutic, gets you back to nature, provides exercise, and fosters general health and wellbeing,” Cr Williams said. Visit the IndigiScapes website for more information or phone 3824 86.